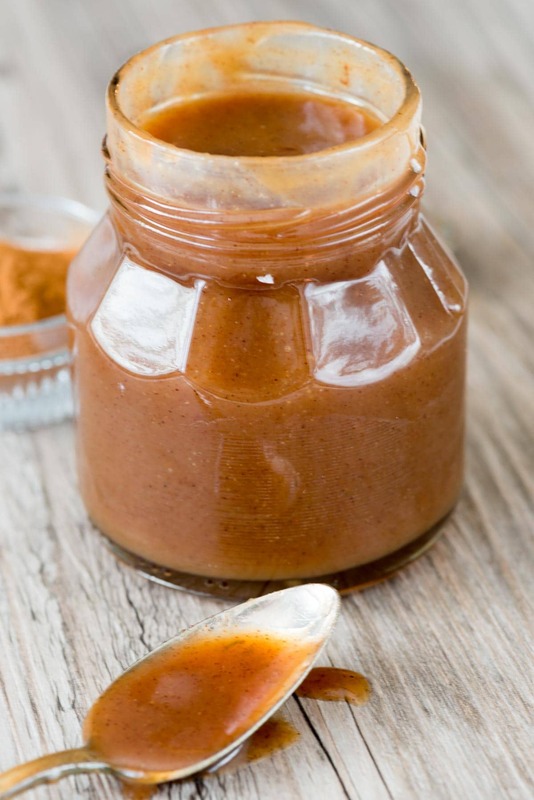 Cinnamon Caramel Sauce – this easy homemade caramel sauce is full of cinnamon flavor! Just 5 ingredients, it’s so easy to make and perfect for fall. Want to hear something funny? 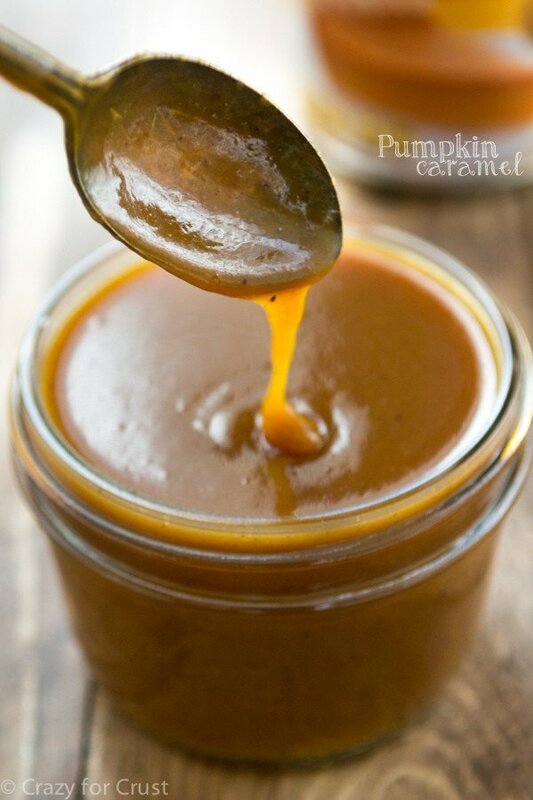 I actually made this recipe two years ago when I made my pumpkin caramel sauce. I never photographed or posted it because, honestly? It was gone before I could get the urge to shoot it. I decided that since it’s fall again, I should make the recipe and actually post it this time. It makes a great gift, a great fruit dip, and an even better topping for cheesecake. 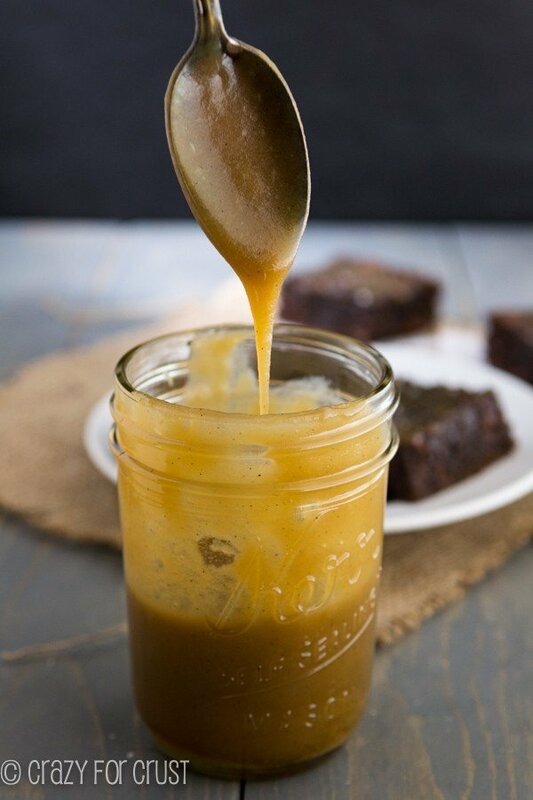 What makes this homemade caramel recipe different than all the others? I added a hefty dose of cinnamon to the mixture. The sweet and rich caramel flavor comes through with a strong taste of warmth and flavor from the cinnamon. If you ask me, cinnamon should be a year-round food. Caramel sauce is one of those things that I always forget I can make. I end up buying the sub-par stuff (or spending a LOT of money on a tiny jar of a premium brand) even though the homemade version is just so much better. It’s richer and creamier and the flavor is just so much more, well, caramel-y. While making caramel at home can seem daunting, it’s not any harder than making pudding. If you’ve made homemade pudding or meringue, browned butter or made a béchamel sauce, you can make caramel. Trust me, like homemade pudding, once you make cinnamon caramel sauce yourself, you’ll NEVER want to go back to the jar again. You only need 5 ingredients: sugar, butter, cream, vanilla, and (for this version) cinnamon. If you add salt, one more ingredient, but that’s optional. It takes no more than 15 minutes to make this easy cinnamon caramel sauce and you’re going to have to make yourself not eat it straight from the pan. Boiled down to the basics, caramel is cooked sugar. You add granulated sugar to a cold pan and heat it over medium-low heat until it becomes liquid. It’s important to watch it carefully and stir it often, so it doesn’t burn. I think that’s why people shy away from making caramel at home, because it does burn easily. Like, when you watch Cupcake Wars and the chef makes caramel for a garnish and they always forget about it and it burns and almost starts a fire. People see that and think, ohmigosh, caramel is too dangerous and hard to make. But remember: you’re not also making 1000 cupcakes for a fake cupcake display at a fake party. You’re probably JUST making the caramel so you won’t forget it’s cooking. Just watch it and it’ll be okay! Once the sugar is liquid, you add butter and cream. It bubbles up and cooks together. Once it’s smooth, you can remove it from the heat and add your flavoring. Most often this includes vanilla extract, but MY version includes cinnamon: a lot of it. If you’re in love with salted caramel (who isn’t?) you can also add salt to taste. This also depends on the kind of butter you use (salted vs. unsalted). If you’re using unsalted butter you’ll definitely want to add some salt. Since salt is a personal preference (carefully) taste and add as much or as little as you want. 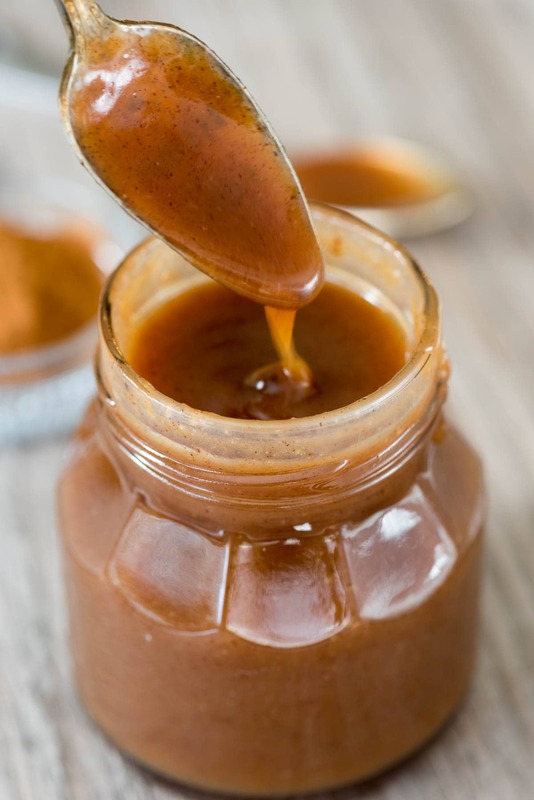 This cinnamon caramel sauce is great as a topping for cakes and cheesecakes (and it’s what I used on the Caramel Apple Cheesecake the other day). It’s also great as a dip for apples; I packaged this in Jordan’s lunch using these little shot glasses with lids I got at the wine store. Or put it on ice cream or do what I do best….eat it with a spoon!! 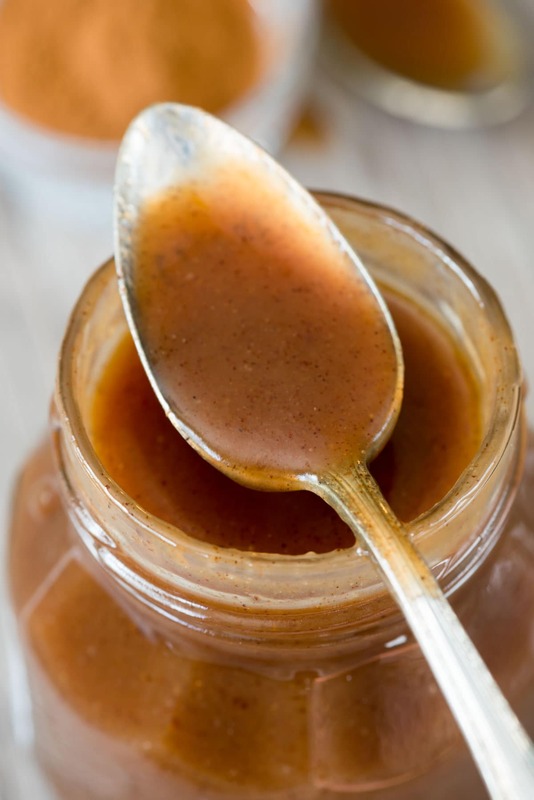 Cinnamon Caramel Sauce - this easy homemade caramel sauce is full of cinnamon flavor! Just 5 ingredients, it's so east to make and perfect for fall. Note: making caramel is something that needs your undivided attention. Make sure you have all your ingredients gathered before starting and that you are not distracted. Leaving the caramel alone at any point can cause it to burn. Once the liquid turns amber, add the butter and stir until it’s melted. Add half of the heavy whipping cream, stir, then add the rest. It will bubble up as you add it to the mixture. Turn off the heat and then stir in the, cinnamon, vanilla, and salt, if using. Stir until smooth. You may need to whisk it to get out all the clumps. Pour the caramel carefully into a jar and let cool to room temperature. It will thicken as it cools. Cover and store in the refrigerator. When ready to use, remove the lid and heat in 30 second increments until the caramel is melted and smooth and the desired consistency (about 60-90 seconds for the just-made texture). Will keep for 2 weeks in the refrigerator. 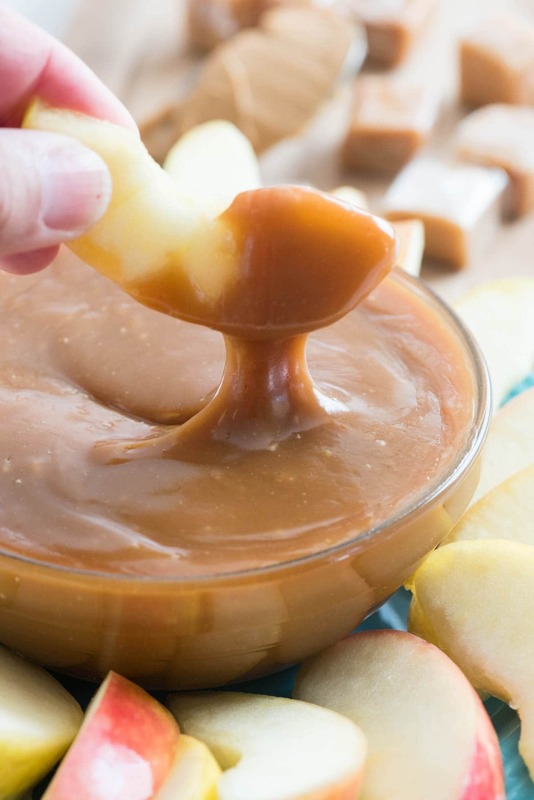 I completely agree – homemade caramel is so easy and so much better! Loving this cinnamon version! Pinned! Yes, homemade caramel is waaaay better. And I never say no to cinnamon. I’m obsessed! This sounds just wonderful! You make everything sound so easy- I must try this for sure …just for eating it by the spoonfuls! Yummy! I’m imagining it stirred into my coffeee!! Ha! I always tend to forget how easy it is to make caramel sauce and end up buying it, too! This cinnamon version sounds delicious, and I can think of SO many fall desserts that need to be smothered in this! Oh yes, and get me a straw! Made this today and served it on warm over apple pie and vanilla ice cream. Sooooo good. It tastes like the best part of a cinnamon roll. Made this without the cinnamon to put in my husbands birthday twix cake… everyone was very impressed with how good it was!! Thank you for making an easy to follow recipe that didn’t require an extra trip to the store. very nice recipe. definitely will try it in my next cake recipe.